In the past five years, there has been an enormous and irreversible shift toward workplace mobility. Today, only around 20% of the workforce is deskbound. There is a significant percentage of workers who spend the majority of their time on the road (i.e., “road warriors”), and a much larger percentage that has a need to move about the building, the campus, or even between sites to perform their jobs. To be maximally effective and productive, these mobile workers require portable technology in the form of laptops, PDAs and mobile phones, along with specialized mobile applications and a corresponding network capable of supporting this mobility. Wireless LAN (WLAN) technology, commonly referred to as Wi-Fi, was developed to do just that. Looking first at cost, a common starting point, the analysis can be approached from a number of angles. In determining ROI, one can and should consider the increased productivity. However, since that can be difficult to quantify, it’s worth looking just at the associated capital, installation and support costs. Consider a green field deployment in a 25,000 square foot ranch office with 100 employees, each requiring voice and data to their desk. The wired plan is straightforward, roviding one port to each desk. No redundancy is included as this is a common cost-reduction in a branch office. 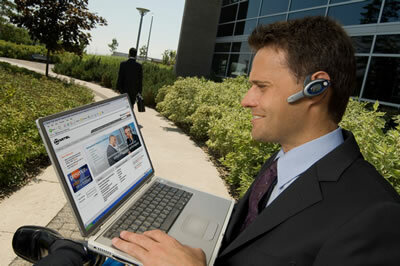 For wireless, an 802.11a/b/g network is used to provide secure voice and data access for each employee. The network is designed using five dual radio APs, or ten clients/devices per radio. In addition to the 88% savings on capital and support costs, the cost of moves/adds/changes is virtually eliminated with an all wireless edge as the network seamless supports users who are presumed to be moving continuously. While security was a weak link in the early days of WLANs, these issues have been addressed so effectively that it could be easily argued that wireless networks are more secure than wired networks. As discussed above, wired network security is set up as a perimeter. Once inside the office, users are wrongly assumed to be “safe” to access the network, and security is applied based on the port into which someone plugs their PC. But mobility breaks this security model as users are not connecting to a specific port. WLANs are now protected with very strong authentication and encryption technology, and they are able to identify and apply security policies based on who the user is, what type of device it is, how it is authenticating, when and from where it is connecting, and more. Some mobility controllers integrate policy enforcement firewalls, enabling them to implement role-based access control, tying users to policies and roles defined in directory services. Because the concept of deploying Wi-Fi as the primary access medium is relatively new, there have been challenges. Fortunately, with the maturity of new WLAN offerings, these challenges can be overcome through proper design and implementation. Here at SecurEdge Networks, we can design, deploy and support your wireless network with security, capacity and coverage in mind. Contact us today for a Free Consultation and Wireless Network Design.